Neither man was born into a family with theatrical roots, but each did grow up in a household filled with music. 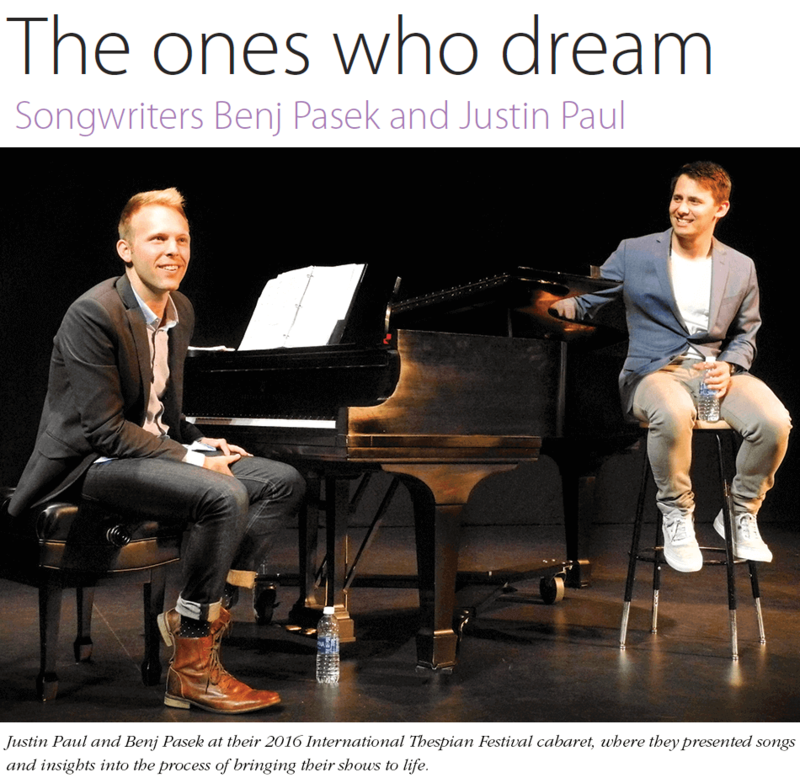 At age 7, Pasek made a guest appearance on one of his mother’s several children’s albums, and Paul sang gospel in his dad’s church. In 2003, Pasek and Paul each headed to the University of Michigan as musical theatre majors and met before classes had even started, bonding during freshman orientation weekend over their shared love of Merrily We Roll Along (the show they pay homage to in their song cycle Edges). “We became instant friends,” Pasek said. The team booked Ann Arbor’s Kerrytown Concert House and began writing. “We figured, if we invited everyone we knew, that would be our motivation to write the show. 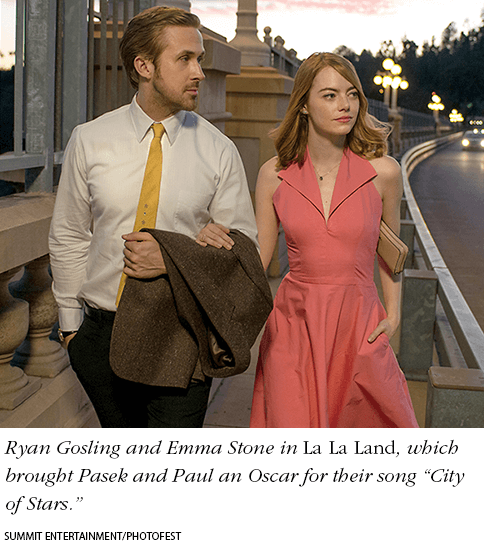 We didn’t want to embarrass ourselves further,” Pasek explained. The result was Edges, a collection of songs about coming of age in the new millennium and the struggles of college kids figuring out how to become adults. They then asked Marx to listen to Edges. He was impressed enough not only to give it to his agent, who agreed to represent the new songwriters, but also to bet on them. The agent’s first deal was to license Edges with MTI; Marx’s bet was a $7,000 down payment toward the team’s future, to be repaid only if they made it to Broadway within the next decade. The summer after their Vegas internship, they made their New York debut with Become, a benefit concert of their songs in May 2006, performed by fellow Michigan alums Gavin Creel, Celia Keenan-Bolger, and others at the Public Theater’s cabaret venue, Joe’s Pub. When they graduated with their musical theatre degrees that December, the pair had the royalties from Edges and Marx’s contribution to help them make a more permanent move to New York. “We thought it was so important that we finish all our credits quickly and graduate college early,” Pasek said, “because we had gotten a job writing for Johnny and the Sprites,” a Disney series that Avenue Q actor John Tartaglia created, produced, and starred in. Their writing led to a Dramatists Guild fellowship, mentored by Lynn Ahrens and Stephen Flaherty, and to songs for Theatreworks/USA and others, but the young writers found it necessary to supplement their income with various odd jobs. In addition to playing for a church and for children’s music classes, Paul conducted. Meanwhile, Pasek babysat kids at a gym while their parents worked out on elliptical machines. When Tim McDonald of iTheatrics was looking for collaborators to work on the adaptation of Roald Dahl’s James and the Giant Peach, he got a call from Lynn Ahrens, then one from Freddie Gershon at MTI, then one from Michael Kerker at ASCAP — each suggesting Pasek and Paul. “I thought, ‘These guys are either the second coming of Sondheim, or they were owed favors by a lot of people,’” said McDonald. Less than a week after meeting the songwriters, McDonald knew he had found the perfect collaborators. James and the Giant Peach had a workshop production in 2010 at Goodspeed Musicals and its world premiere in 2013 at Seattle Children’s Theatre. Through the multiyear development of that show, the two men kept begging their agent for more work. Then A Christmas Story came up. As they had for James and the Giant Peach, the men wrote a few songs on spec, which landed them the job. The show had begun at Kansas City Rep in 2009, and Pasek and Paul joined the production in Seattle at the start of its national tour in 2010, which ended in New York for a limited engagement in November 2012. The show received three Tony Award nominations, including one for the score by the songwriting team, who had made their Broadway debut ahead of Jeff Marx’s prediction. At the show’s opening night party, Paul handed Marx a check that repaid the loan. As they were beginning work on A Christmas Story, Peter Duchan brought them the idea for Dogfight. The duo’s first stop was Ira Weitzman, a musical theatre producer at Lincoln Center, who was interested enough to offer them a commission. They also submitted an early draft of the show for the Richard Rodgers Award from the American Academy of Arts and Letters — and won, which helped finance its production at Second Stage. Ahrens and Flaherty came to the first preview of Dogfight and offered notes to the young writing team. Stephen Schwartz came the second week and likewise offered notes. Paul said, “There’s an intrinsic desire for writers to pass along the art form and to mentor new people, to take them under their wing.” Pasek added, “You want other shows to succeed. Frozen and Hamilton only make people want to see more musicals.” The songwriters successfully synthesized the advice they received, and Dogfight garnered a Lortel Award as best Off-Broadway musical of the 2012-13 season. They took their own advice to heart with Dear Evan Hansen, which grew from an idea Pasek had in high school. In 2000, one of his classmates died and Pasek was struck not only by the tributes but also by the number of people claiming to be a dear friend. In 2009, when he and Paul met producer Stacey Mindich, whose funding had helped commission Dogfight at Lincoln Center, he mentioned the idea. Mindich not only introduced them to librettist Steven Levenson to help develop the show, but she also helped finance the work. 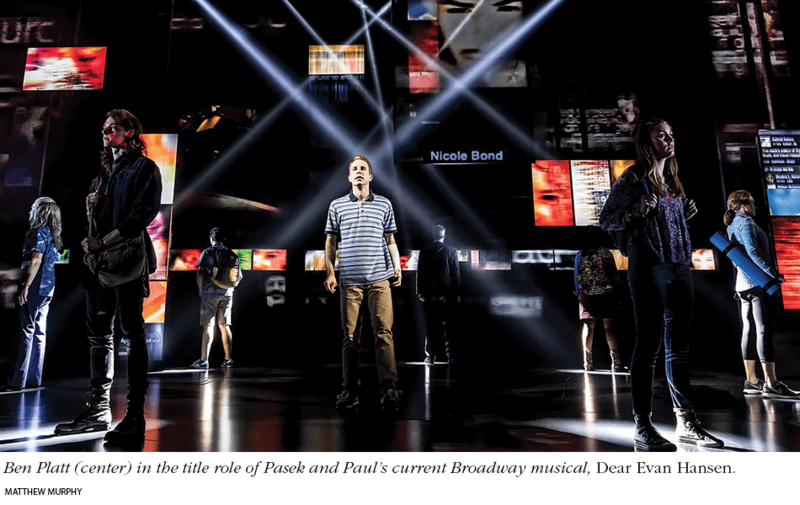 Dear Evan Hansen is a favorite to pick up a few Tony Awards next month, but whether or not it does, Pasek and Paul remain happy. As Paul recently told the New York Times, “Our goal was always, if we could just write songs and tell stories, and get to do that every day, that’s our dream.” And it seems likely they will continue to live their dream for quite a while.